So simple, I’m embarrassed to call it a recipe! Dead easy to make for trick or treaters or for your own little monsters. Break pretzels in half and push them into the sides of the cupcakes. Do 4 per side. Push two matching smarties into the front of the cupcakes for eyes. Notes... You can always make these cupcakes from scratch to minimise the sugar in these spider cupcakes, but if you're pushed for time - most large supermarkets have pre-made cupcakes. What a great idea – and such a time saver too! Easy to do if I don’t have much time. Thanks. These are really cute! I’m looking for ideas for my bake sale..you just gave me a great idea, thanks! great fun that kid can create them them selves. Super easy and good for Halloween. 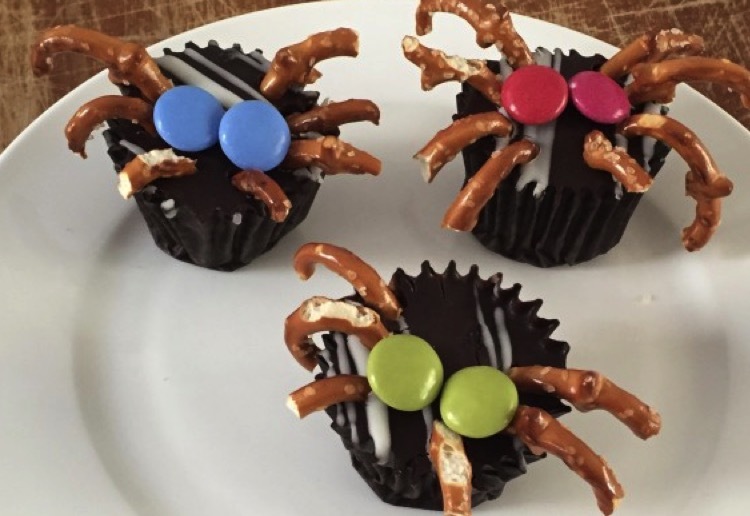 These little spiders will be making an appearance on our Halloween table. Ours too! Super simple and quick to make helps as well.